River floats like this one provide a great way to keep cool and enjoy the company of your friends or family. Here we are my favorite river, the St. Croix River enjoying a day at the beach I grew up on. Catching up with my sister, daughter, and good friend Sandra from South Africa on a hot summer day on the Paradise Pacific. On a 90 degree sunny day it's way more fun being in the water than sitting in beach chairs. The inflatable backrests and drink holders are great features and a mesh center means the refreshing water will keep your feet cool. It seats 4 adults comfortably (but you can seat more) and the grab handles and ladder makes it easy, well maybe not easy, but with a little help, get into the Pacific Paradise lounge float. Made out of high quality, durable vinyl it should last for several years - as it has for my sister. The float can be tied to the back of your boat or a dock as another option. You will need an electric (not a hand pump) to blow this big guy up. 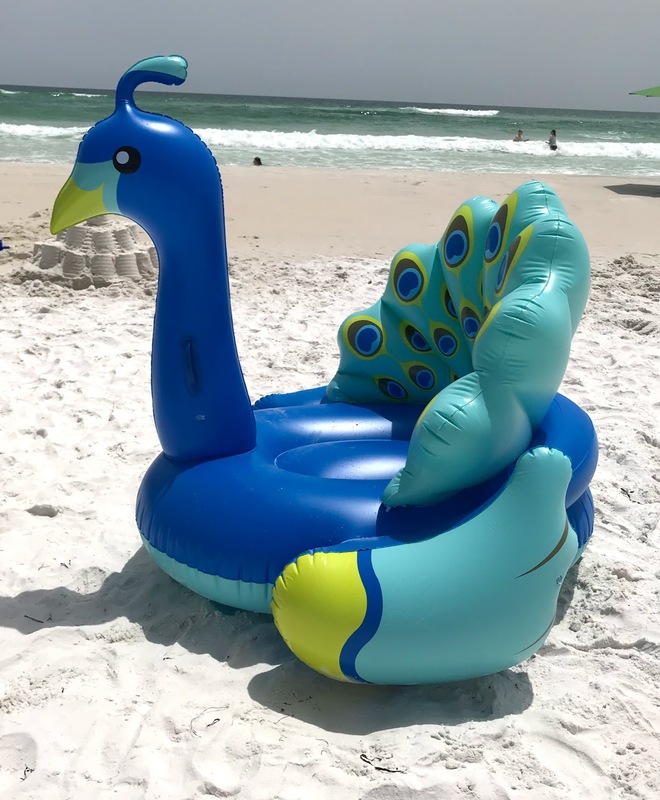 If you are looking for a large ocean or lake float ( it measures 100" by 100") that can accommodate several people this is the one. We told our granddaughter she could pick a large pool float to bring to the ocean. She chose this beautiful blue peacock who has followed us to the beach and to the swimming pool. Everywhere she goes she gets lots of compliments and attention. Best of all she's lots of fun in the waves and in the pool. 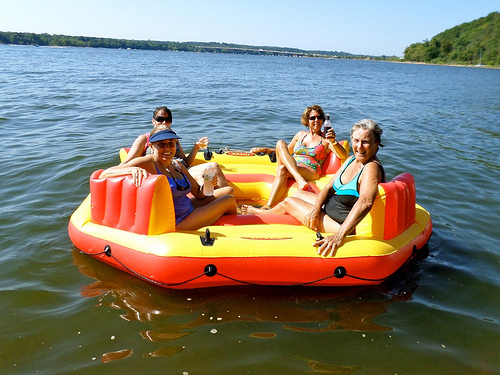 Catch up with up to 6 friends on this lake floating island by Tropical Breeze. Back rests provide comfort and a removable sun shade provides protection from the sun. 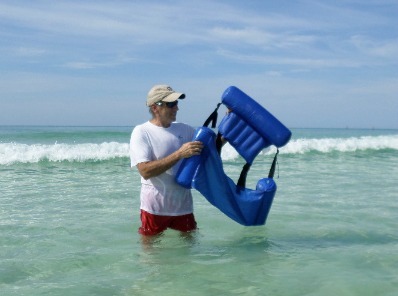 A cooler bag and beverage holders mean you can just keep floating all day without having to head to the shore to replenish. 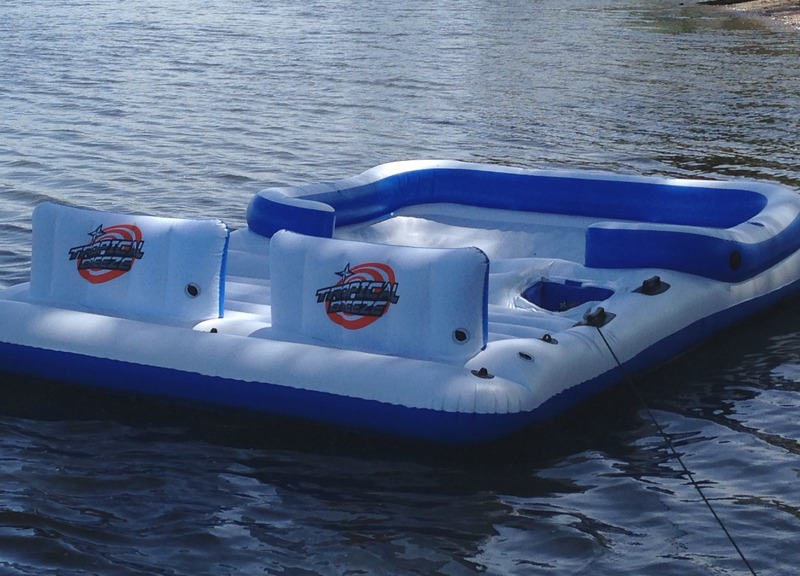 Up the comfort (and the price) with this lake float which has two coolers (can accommodate a 6 pack and ice) and a mp3 system to play some tunes while your floating on your favorite lake. It can also hold more people - the more the merrier, right? 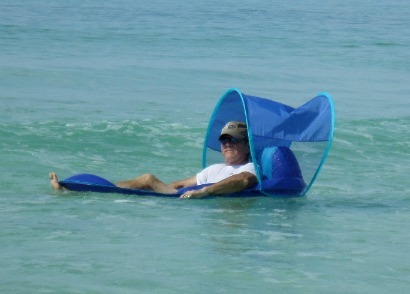 OK - what's not to like about this ocean float?? Want some shade, attach the cabana cover. Need to keep drinks or food cold, store them in the cooler. Want to stay put and not drift out to sea, set the anchor. The cover is vented so a nice breeze can keep you from getting too hot. This one comfortably fits 4 adults and maybe a couple of kids. I love a float that has a canopy to protect me from the hot sun. However, the canopy is detachable so if you want full sun it is an option. The float is big enough for two adults and perhaps two small children. If you like to float above the water and not get wet this is the float for you. There are two air chambers and two built in cup holders that hold cans. A back rest means you can comfortably rest upright. Rest with the comfortable back rest, relax and savor the experience! Approximate deflated size: 781/2" x 59"
Coleman electric inflator for $29. It was fully inflated in about 5 minutes. Bought a little 10lb mushroom anchor to keep it in place and floated for 8 days in pure heaven! If you enjoy extra space or want to share your float time with someone special, then give this extra large cabana float a try. The nice big canopy offers shade and the backrest offers comfort. 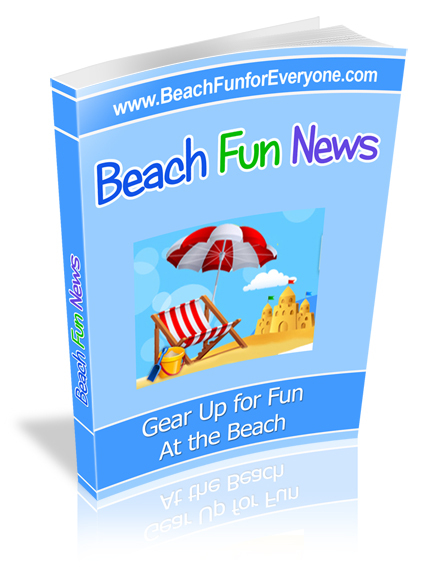 Beverage holders for two and and a battery operated pump is included in the purchase. Heavy duty nylon means durability. Very sturdy and lots of room. We will never go to the beach again without this float. The mesh bottom keeps one cool and the canopy keeps the sun out. Just relax and roll with the waves with your feet up and your head resting on the headrest. Next year we are bringing two to help keep the peace. 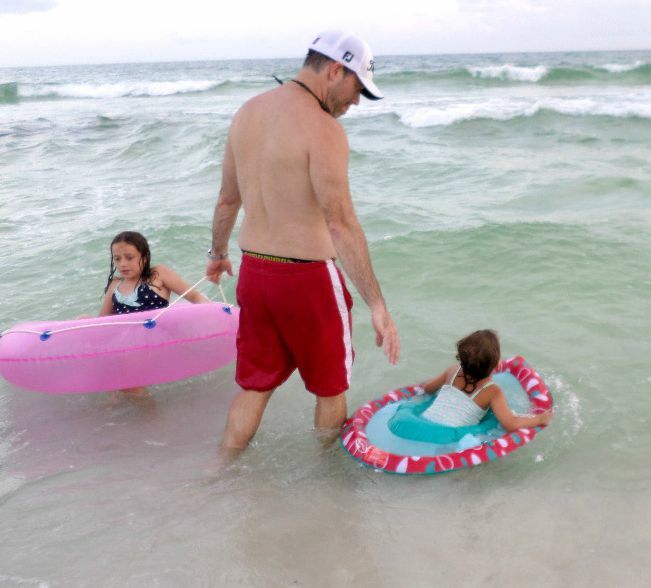 It is easy to inflate and deflate - which means there is plenty of room to pack it for your next beach vacation. If you enjoy sitting up in a chair like position so you can see what's goin' on around you or to visit with another person, you will like this floating chair. The straps are adjustable so it fits any size person. 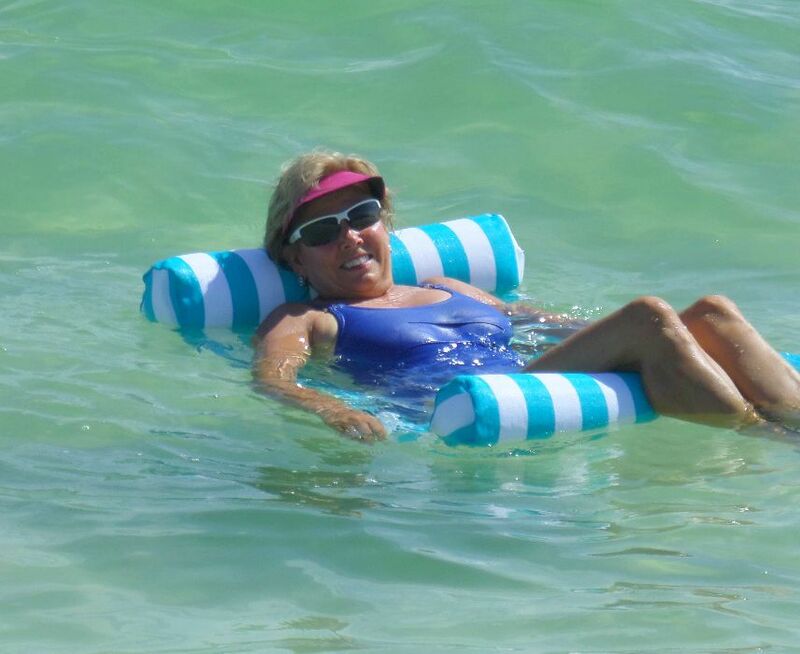 It's very comfortable, easy to inflate and deflate which means it's easy to take with you on any beach vacation. 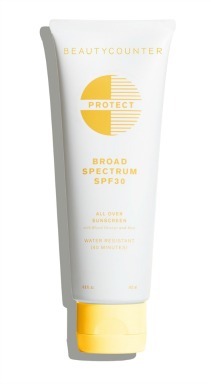 We've had ours for two years and use it at the beach and in our pool. Very durable, comfortable and easy storage. It is by far our favorite floating chair. 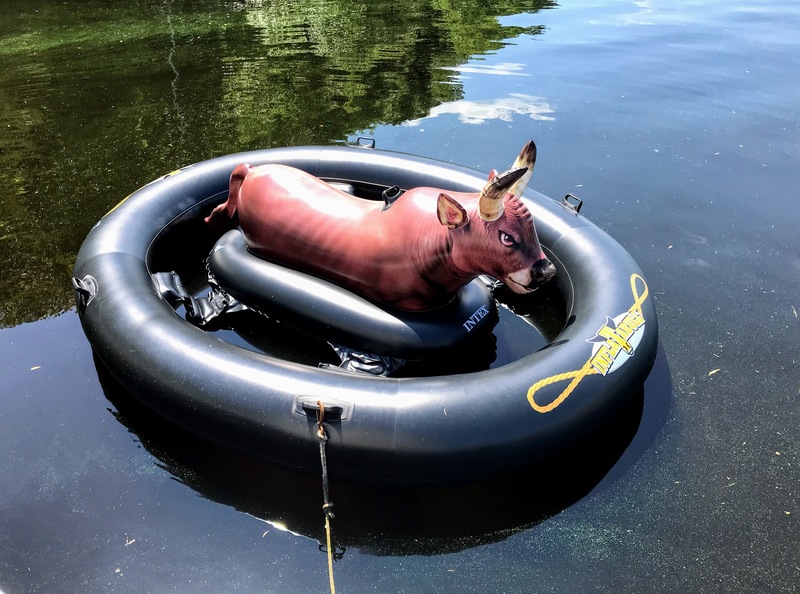 Ride the bull and enjoy a soft landing in the water. This guy isn't mean but he is big, measuring 94" x 77" x 32". Intex Inflat-A-Bull, Inflatable Ride-On Pool Toy, 94" x 77" x 32"
A water hammock relaxes you just slightly below the water so you can stay nice and cool on a hot day. A comfortable headrest and support just under the knees makes for a fun floating hammock. Two inflatable tubes - one for the headrest and one for the leg rest can be deflated and the hammock can be rolled up to put in a suitcase for traveling to a beach vacation or just for easy carrying to the beach. 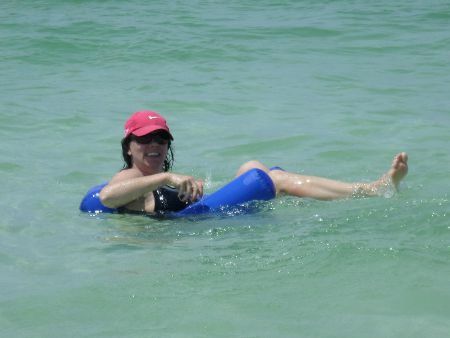 A simple large inner tube for older kids (with adult supervision) is a great float for the river, lake or ocean. Kids love riding the waves on an inflatable float like this really large turtle. These floats have come a long way - and this one especially is very stable which means you don't tip over into the ocean, lake or river by simply leaning a little too much. It's not just large - it's huge measuring 75" x 67". Two handles - one on each side and a wide stance adds to the stability and a fun ride in the water. Made of tough, durable plastic this turtle will add another element of entertainment at the beach. 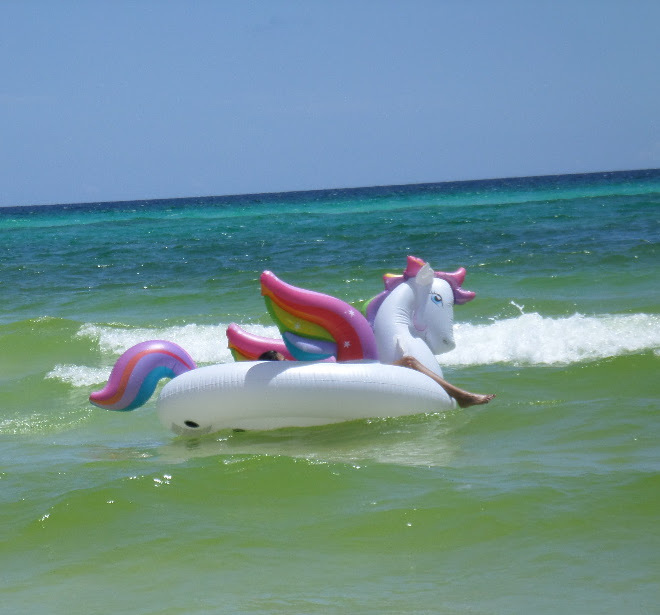 Ride the waves and see if your unicorn will take flight with this heavy duty super large pool, lake or river float. There is plenty of room for more than one person to double or triple the fun.